Disney has been hosting race weekends for years and due to the popularity of these events, they've continued to add more options. Today, I have a Q & A with Matt from the former TeamRunDisney.com site. Hopefully this will give you a good idea about which races are available and what to expect if you decide to attend. Q: I know that there are several Disney races scheduled now. Can you name the ones that are currently offered and when they are generally held? Q: How much do races cost? Q: What is it about Run Disney events that make them unique and make people want to travel long distances to participate? Q: How far in advance do you suggest people sign up for Run Disney events? Q: Are there benefits to participating in a Run Disney race (like getting discounts)? Q: How does the schedule around a race usually work (like when is the expo held, what time are the races, etc.)? Q: Do you have suggestions for how to combine theme parks with a race? It seems like lots of walking in the parks before a race would make runners tired during the race but touring theme parks after a race doesn't seem like it would be easy, especially after some of the longer races. Do you have tips for people wanting to attend a race? For instance, I've read that lots of people take a throwaway jacket to wear before a race but then take it off (and never go back to get it) once the temps warm up. Q: Is there an age requirement for entering races? Q: What pace should people be able to run before going? I assume they are "swept" if they don't meet that pace? Are there separate corrals for people with different paces? Q: How often can runners expect to find water and bathroom stations? Q: What activities (including meeting characters) are usually found along the running route and how does that work? Q: Where can we follow Team #runDisney? 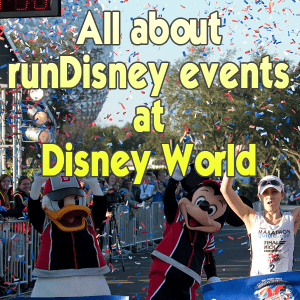 Right now runDisney offers 8 race weekends (5 at Disney World, 3 at Disneyland). Each weekend consists of at least a 5K and half marathon, with some weekends offering additional races. The race weekends currently being held are the Disney World Marathon Weekend in early January which consists of a Family 5K, a 10K, a half marathon and a full marathon. Runners also have the option of taking part in one of the weekend’s challenges, the Goofy Challenge which is the half marathon and full marathon run back to back, or the new in 2014 Dopey Challenge, which consists of running all four races consecutively. The Princess Half Marathon Weekend takes place in late February and consists of a Family 5K, a 10K, and a half marathon, along with the Glass Slipper Challenge which is the 10K and half marathon run back to back. In May, runDisney hosts the Expedition Everest Challenge. This 5K nighttime race is a mix of obstacle course and scavenger hunt through the Animal Kingdom. runDisney takes its runners through two nighttime race weekends in October with its Tower of Terror 10 Miler Weekend, and in November with its Wine and Dine Half Marathon Weekend. Both weekends feature a Family 5K race, with the Tower of Terror’s 5K race being a trail race through the paths of ESPN’s Wide World of Sports. No challenges are offered for either weekend. In addition to the main races of the weekends, runDisney race weekends also feature kids’ races, varying in distance from 100m to the Mickey Mile, and what’s known as the Diaper Dash for those future runners not quite ready for their first steps. The races vary in their prices, with the price of the races usually increasing each year. Registration for a half marathon distance is usually priced around $185, which includes a tech shirt, finisher’s medal, personalized bib, and goody bag. Registration for a 10K/Half Marathon Challenges will usually run around $320, while the Dopey Challenge was priced just under $500. For the 10K/Half Marathon and Goofy Challenges, runners receive three shirts and three medals commemorating their runs. For the Dopey Challenge, runners receive the same three medals and shirts as the Goofy Challenge runners, in addition to the 5K and 10K shirts and medals, and a special Dopey shirt and medal. In watching all of the excitement surrounding a race weekend in the Team #runDisney group, there are a couple of things that set runDisney races aside from all other race events. One of the biggest is, it’s Disney! There is something so magical about being able to run through Cinderella’s Castle and have experiences that you can’t have anywhere except Disney. And everything runDisney does, they do on a grand scale. The medals are amazing, the starting lines and finish lines are incredible, the announcers are exciting and encouraging – things you don’t find at your local half marathon. Another big draw for the races is the people that actually participate in the events. Thanks to social media, runDisney has grown a following unlike any other race out there. The people who run the races are so passionate and supportive of one another that it helps bring people into the races. Disney races appeal to all levels of skill when it comes to running, and through social media, the first time runner can find an amazing support system that will help get them through their training and race. With the popularity of runDisney races increasing, those looking to register for a runDisney event should sign up on the day registration opens. runDisney has been expanding their race weekends, through the addition of new 10K events and challenges, along with brand new race weekends, and this has led to a registration frenzy. Those that don’t make it in through the normal registration channels do have other options. There are some travel agencies that carry race registrations as part of their travel packages, in addition to some charities which will also have registration availability, in exchange for some fund-raising in support of the charity. Those who are Annual Passholders or Disney Vacation Club members are given the opportunity to register early, usually a week before registration goes on sale to the general public. These pre-registration fields are limited though, so as not to allow for the pre-registration to cause a sell-out of the entire event. Runners taking part in the race weekends can usually find discounted park tickets through runDisney, as well as discounts on hotel packages both through runDisney and their approved travel agencies. During the Disney World Marathon Weekend and Princess Half Marathon Weekends, Disney has offered special after-party events in Downtown Disney where runners could present their medals for discounts at certain retail locations. The race weekends are typically four day events, though they can extend out to five days during the Disney Marathon Weekend due to the number of races offered that particular weekend. Typically the race expo will start the day before the first race during which runners can pick up their bibs, shirts, and limited edition runDisney merchandise and also check out all of the great running related vendors that are there with their merchandise. For Disney World race mornings, runners tend to need to leave at least two hours before the event. Traffic can be a major problem for those trying to get to the starting line. Depending on the race, runners may have a twenty minute walk to the starting line – such as with the Disney World Half and Full Marathon and Princess Half Marathon. For the night races in Disney World, the races usually start around 10 p.m., with runners being encouraged to get to the starting area at about 8 p.m.
runDisney always has plenty of entertainment before each of their races to keep runners from feeling like they’re just standing around waiting for time to pass. After the Wine and Dine and Tower of Terror races, runners end right in the theme parks and can enjoy after-party events with rides and food in Epcot and Hollywood Studios respectively. Tying in the theme parks can be a bit of a challenge because it’s easy to forget how far you’re actually walking during the course of a day. One way to make sure you don’t overdo it is to plan your days carefully. Aim for smaller parks and more sit down attractions. Build in breaks into your day where you can go back to your hotel and sit at the pool or take a nap. And don’t try and overdo it. If you’re running one of the challenge races offered by Disney, you’ll find yourself with an early wake up time multiple days in a row. Even though it’s Disney, go to bed early. And prepare your body ahead of time. Unless you’re used to waking up at 2 a.m. every day for morning races, or staying up until 3 a.m. for night races, get your body adjusted the week before by putting it on a schedule that it will be on during race weekend. 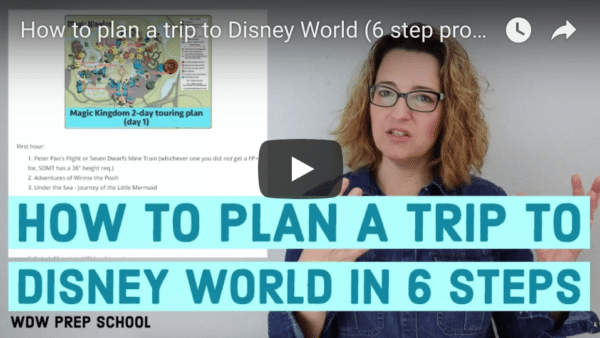 There are so many possible tips that could be given for preparing for a Disney race weekend that it’s nearly impossible to try and cover them all. The one thing I suggest to anyone considering a runDisney race is to join a group such as Team #runDisney, and jump in and ask questions. There are so many wonderful people with all kinds of tips, tricks and experience that they’re willing to share with others. From what restaurant has good pre-race food to should I run with my MagicBand, for every question a runner might have, these groups will have an answer to help. Each race has its own unique age requirements. The 5K races are open to individuals of all ages. The 10K races require that runners be 10 years of age or older. In order to run the half marathons, runners must be 14 or older. For the Full Marathon, Goofy Challenge and Dopey Challenge, runners have to be 18 years or older. runDisney sets a pace requirement of a 16 minute mile in order to avoid being swept during the race. That 16 minute mile pace starts when the last runner crosses the starting line. Runners are broken down into several corrals based on their anticipated pace which they must be able to support for the half and full marathons with proof from a previous race. About every mile and a half or so, runners can find water stations equipped with Power Ade and water. During the half and full marathons, runners will also find Clif Shots, bananas, and during the full marathon, the amazing candy stop at Mile 23. Bathrooms can also be found at these locations, and during the time spent running through the park, runners have full use of the park bathrooms as well. Each race is packed with entertainment all throughout the courses. During each race, runners will find characters, cheerleaders, marching bands, hula dancers, kite flyers, DJs, classic cars and all sorts of other amazing sights. Runners can have their photos taken with the characters, many of which are not your everyday characters, simply by running up and making sure their bib is showing to the camera. Lines can form, but tend to move very quickly for these photo ops. The crowds at a Disney race are unlike any other race. In Disney World, spectators pack the course with signs and banners all through the Ticket and Transportation Center and Magic Kingdom, as well as the finish line encouraging runners on as they pass. After the race, runDisney does an excellent job of providing a family reunion area at the finish line area where runners can find their loved ones. Banners are set up in this area in sections designated by the first letter of the runners’ last names. But the best thing a runner can do to find their loved ones after a race is plan on a place to meet before the race starts, ideally under one of these banners. The finish line area can be extremely chaotic, especially because the area where runners meet their families is set pretty far away from the actual finish line. The main group page for Team #runDisney is www.facebook.com/groups/teamrundisney. All are welcome to join to keep up on the latest runDisney info, and to meet other runDisney enthusiasts. We can also be found on Twitter and Instagram, and on our new forums at teamrundisney.boards.net. Are you planning to sign up for 1 of the races? Or do you have additional questions? I’m interested in participating with my family in one of the princess races but I am in a motorized wheelchair are there any regulations when it comes to wheelchairs? I am looking to do my first run this year, and I am season pass holder so I want to do early registration. Will I get special email with a link to follow to sign up , or do I go to the regular RunDisney website and sign up like normal? My friend had a time of 2:16 and mine at a 2:24 in our last half. We would like to run together. Would the corralling allow this? I have run the Princess Half a couple of times and they do allow you to run together. RunDisney will allow for the higher corral individual to go to a lower corral. For example if your friend is in corral C and you are in corral D, she can move down to your corral, but you can’t move up to hers. One thing to consider is that these are not necessarily “races” as much as events and experiences (unless you’re in a very front corral). If someone is coming with the expectation of setting a PR, they will likely be disappointed as there are a LOT of people who are part of it for the adventure. This is not a critique but just be prepared for people to ignore the “slower participants to the right, pass on the left” way of thinking. I completed the Disney half in January and had to spend a lot of time adjusting to the person in front of me stopping to walk without moving over or having to duck between crowds. Also, lots of groups competing and taking up the whole road. That said, it was an amazing experience. Lots of people and groups use these races as fundraisers and there are so many positive stories. The volunteers are wonderful and I encourage anyone taking part to thank each and every one they encounter (especially the ones getting drenched handing out drinks!) Provided I can convince my hubby to keep my 3 kids for the weekend again, I hope to do another Disney run. Everyone who completes the race receives a medal! I’ve run the princess half twice and there are many walkers. Ditto my response to Matt, Suz! A question I’ve had regarding the races is the ratio of who walks the races versus who runs. (I’m a walker w/a 15 min pace) Can you walk it if your pace is under the 16 min pace? I’m assuming you can walk them but just need info on that. Also, what are the prizes for winning it, completing it, etc. Being Disney I’m sure everything is over the top on things like this. I saw the medal, but is that for winning? I’m assuming it is. You mentioned going and picking up your things needed for the race. A picture or pictures of the shirts, and things would be neat to see. Overall, thanks for the interview, it was the informative on things I’ve wondered about. One of the great parts of runDisney events is their appeal to both walkers and runners and there are probably close to as many walkers and run/walkers as there are runners. If you have a time that you can submit from a previous race, you’ll most likely end up in a higher corral, which means you can have a pace under the 16 minute requirement and still have a cushion of safety where you won’t have to worry about getting swept. The runDisney medals are absolutely amazing and are given to all finishers. Winners of the races receive a plaque separate to the medals given to all finishers. Great info. My daughter and her friend ran the princess weekend family 5k at ages 13 and 14 twice, and loved it. It was exhilarating for the spectators too! One thing not to be overlooked are the costumes. Absolutely hysterical and also creative! One year I saw a man run in full Prince Charming regalia. It also makes it easier to spot your runner coming over the finish line!